15 Best Cocktail Outfits from 2017 - #Weddingz2017Rewind! We are back with another 2017 Weddingz.in rewind! After doing the round-up for Best wedding lehengas and Best bridal makeup we are back with another interesting listicle. We came across some really stunning brides who aced some really interesting outfits bringing the much needed drama to their cocktail night! This custom made water slit Gaurav Gupta gold embroidered gown with ruffles at the bottom had to be on the top of our list. We love these brides who chose to wear this for their cocktail night. This custom made wine coloured Manish Malhotra ensemble with minimal gotta embroidery makes it perfect for cocktail night. How cool is this Manish Malhotra gown? We say it’s a steal with its striking silhouette and intricate gold detailing. This one is another stunner in the ruffled gown category. Ruffles are trending this season and we are loving how this bride has rocked her pastel blue ruffled outfit. This bride looks perfectly turned out for the festivities in this gorgeous cinderella gown. It combines a contemporary silhouette with touches of embroidery along with romance in the drapes and movement of the gown. Sagarika Ghatge looked radiant in her pastel, embroidered lehenga which she chose to drape it as a saree. This bride chose to wear a mint green Kamaali Couture embroidered gown and looked stunning for her cocktail night. We love the beaded detailing on the back and the sleeves making it really unique. Masoom Minawala’s choice of this Tarun Tahiliani saree with a stylish cape is a stunner. We are loving the tassels and the intricate embroidery on it, making it the perfect attire for a cocktail party. The royal blue touch – this fairy tale gown is perfect if you love playful romance, laughter and fantasy worlds. Opt for a outfit like this and you’ll look like a princess on her way to a happily ever after. Bring a touch of the elegance to your celebrations in this pastel pink off-the-shoulder gown . Perfect for a classy cocktail reception night, you can accessorise with statement diamond jewelry and dance your night away. Glow and emanate a regal aura in this unabashedly glamorous silver and blue gown. You’ll look like a queen if you up the shine with diamond earrings and a necklace to dazzle on your D-day. 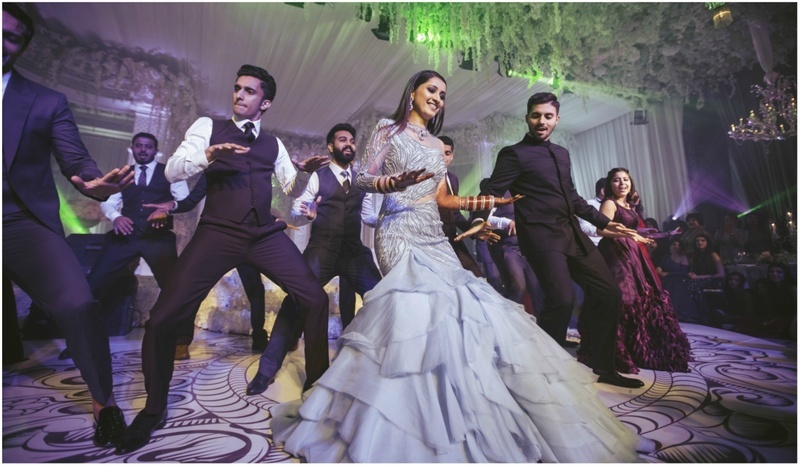 If you are planning to seriously dance your cocktail night away while looking your elegant self at the same time, you should consider wearing a pre-draped saree like this bride here. One can never go wrong with white and when the gown is this elegant you know it’s going to be a hit. If you too are looking to opt for a fish tail all-white gown like this, then we say accessorize it with some statement jewelry in colour like this bride opted for emeralds. If your cocktail party is going to take place near a pool, then we suggest you choose something like this bride here. We are loving her fresh take on the cocktail outfit with the colour of choice. The outfit has a very easy-breezy vibe to it, while still making her look nothing less than a diva. So, have you picked your cocktail outfit already?